For domestic orders, we ship via UPS and USPS. All available methods are shown for quotes and also at time of checkout. UPS cannot ship to P.O. Boxes, APO, and FPO addresses. For larger or high-priced orders, you may be required to have someone over the age of 18 present to sign. 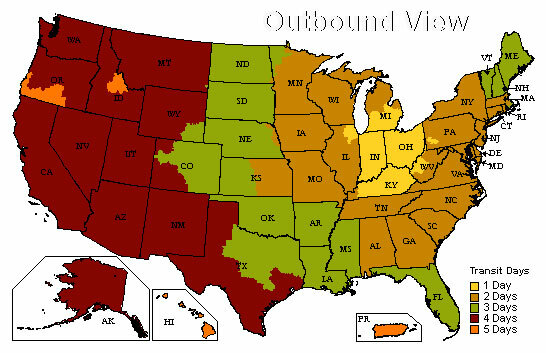 A map is provided for UPS customers with delivery times in business days. Free shipping applies to online orders only in the continental united states and excludes heavy or oversized items. USPS Priority mail is the default method that is used on free shipments. Columbus Percussion always reserves the right to select what method of shipping is used. For international orders, we ship via UPS and USPS. All available methods are shown for quotes and also at time of checkout. Shipping does not include customs fees (if applicable). You may be required to have someone over the age of consent present to sign. If you would like to place an international order for a country not currently supported, please send an e-mail to sales@columbuspercussion.com. We will not use your information (however obtained) for any kind of advertisements unless you explicitly sign up for the newsletter. If you do sign up, we may send you information from drum-related organizations (NAMM, PAS, drum companies, etc.). To unsubscribe at any time, please send an e-mail to mail@columbuspercussion.com with the word "Remove" in the subject line. To sign up for our physical mailing list, please contact us at (614) 885-7372 or (800) 775-7372. We do not store credit card information on our website or anywhere else. If you believe you are a victim of fraud, please send an e-mail to accounting@columbuspercussion.com and we will help you as soon as we are able. You can also reach us during business hours at (614) 885-7372 or (800) 775-7372. Buy with confidence knowing that we don't want you to keep something you don't want. We all hate it when you miss that 30 day window to return the product. So we thought…why cause this same frustration on our fellow drummers/customers! You have 6 months to contact us about returning an item from the time you receive the order. Percussion products being such a personal preference of sounds caused us to offer the 6 month buy and try policy. Need a new ride cymbal? Not sure how its going to sound? Buy the two cymbals you can't decide between and find the one that works for you! Feel at ease knowing you have plenty of time to return the cymbal that did not work. Products must me in the same condition as when you received them and in the original box and/or packaging. We may not accept returns on special orders. Products that have been used such as earplugs can not be returned. Media is also excluded from our return policy. Drumheads that have been seated on a drum are also excluded from returns. When we receive your return it usually will take one business day for the return to be inspected and refund processed. Refunds will automatically be applied to your original payment method. Please keep in mind that depending on your credit card company it can take an additional 2-10 business days for you to receive the funds in your account. For warranty information, please click this link to see a listing of current manufacturers' warranties or contact us. While our website operates 24/7, our store is open from 10-8 Monday through Friday and 10-6 on Saturday (we are closed Sunday). We will be happy to help you with any questions during those hours, and you can also send an e-mail to mail@columbuspercussion.com. We are able to take orders over the phone as well as via the website. An item listing on our website is not an indication of having the item in stock. For questions regarding our current stock, please call us at (614) 885-7372 or (800) 775-7372. Our website accepts VISA, Mastercard, and Discover credit cards. We do not accept American Express at this time. If you are having trouble running a supported credit card through our website, we can process the order over the phone for you. Please call us at (614) 885-7372 or (800) 775-7372. If an item's pricing changes between the time the order is placed and the time your order is shipped, you will receive the price indicated when you placed the order (your order total will never change). Although this mostly applies to an increase in an item's price, it can occasionally mean the price is lowered. Promotions run during specified times and while supplies last. If you order something we cannot get, we will notify you and void the order and the payment. If you created an account to place your order, you can check its status by logging in. If you completed checkout as a guest, please contact us via e-mail at sales@columbuspercussion.com or by calling us at (614) 885-7372 or (800) 775-7372. To update or add billing or shipping addresses for your account, please log in. If you would like to change a shipping address for an order already placed but not yet processed, please contact us via e-mail at sales@columbuspercussion.com or by calling us at (614) 885-7372 or (800) 775-7372.